The PIRATE Model 0.5 Cu. Ft. (50 Lb. 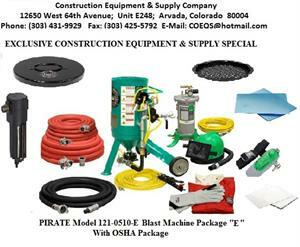 Capacity) 121-0510-E Portable Blaster With Remote Control System, AMV Grit Valve, 25' Blast Hose, Nozzle & OSHA Respiratory Package Holds 1/2 Cubic Foot Of Abrasive Providing Approximately 15 Minutes Of Blasting At 80 PSI With A No. 3 (3/16-Inch) Nozzle. At Less Than 110 Lbs. 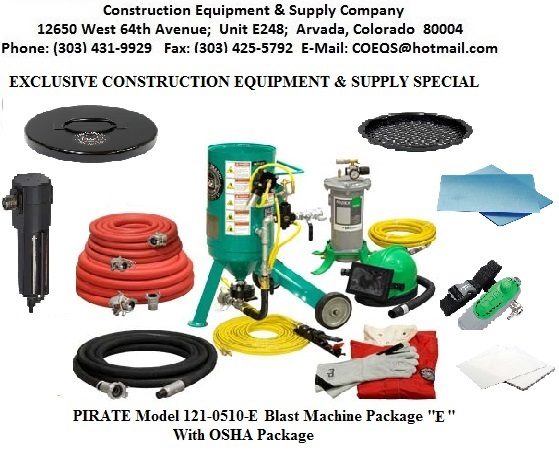 This Unit Delivers High-Performance, Versatile Blast Cleaning System Removes Contamination, Corrosion, Mill Scale, And Coatings From Most Surfaces. Produces A Uniform Surface Texture, And Creates A Surface Profile To Increase Bonding For Coatings. * 25' BREATHING AIR SUPPLY HOSE, 3/8"
AMV abrasive metering valve maintains smooth, consistent, adjustable media flow.